KINGSTON, Oct 12 2010 (IPS) - Anxious to prevent the collapse of Jamaica’s overexploited marine fisheries, the Ministry of Agriculture and Fisheries is promoting the consumption of lionfish to control its burgeoning population. At risk officials say, are the nation’s marine biodiversity, its food security and economic well- being. “The situation in Jamaica is urgent,” said Nelsa English, national coordinator for the Jamaican component of a Caribbean-wide Invasive Alien Species Project at the National Environment and Planning Agency (NEPA). “A lack of sufficient natural predators suggests that it (lionfish) could be a potentially significant threat to Jamaica’s biodiversity and the ecosystem in general,” she noted. Jamaica’s marine resources are stretched to the breaking point, its reefs overfished and degraded due to environmentally unfriendly fishing practises such as the use of explosives, poisons and fishing nets that are below the legal mesh size. Scientists agree that many of the reefs have been reduced to coral communities and no longer function as vital ecosystems because their biodiversity is so severely degraded. Some studies suggest that only two percent of some reefs are live coral and the structures themselves are reportedly being eroded faster than they can regenerate. “Currently our fishing industry survives on the removal of young adults. This practice does not allow for enough fish to mature and reproduce which puts pressure on the fecundity of the ecosystem,” English told IPS. According to English, the presence of the lionfish – which ranges in colours from orange to maroon – in such a depleted marine environment could wipe out the fishing industry. The Ministry of Agriculture and Fisheries estimates that there are more than 30,000 fishers on the island. The lionfish (Pterois volitans and Pterois miles) was first seen in Jamaican waters in 2008 but rapidly spread island- wide. Experts say they can reduce survival rates of small reef fish by as much as 80 percent; growing to an average of 15 inches and spawning up to 30,000 eggs at least twice a year. There are few predators of this Pacific native in the region besides groupers – and there are not many in these overfished waters. 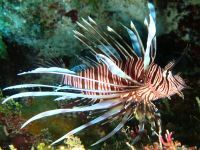 The Montego Bay Marine Park, a marine reserve and fish sanctuary on the island’s north coast, is culling the lionfish to reduce their numbers. “During underwater surveys, it would be normal to encounter at least three lionfish during a daytime dive. During dusk/dawn hours, these numbers could be easily reach three or four times that number,” said Brian Zane, the park’s executive director. Cullings are carried out in association with the Fisheries Division of the Ministry of Agriculture and NEPA, the agency responsible for managing Jamaica’s natural resources. Officials are examining the feasibility of installing a branching reef structure – said to be inhospitable to lionfish – in what is also a national park. NEPA and its partners have drafted a National Strategy and Action Plan for invasive alien species (IAS). Agriculture and Fisheries minister Christopher Tufton is already leading an aggressive public education campaign to get Jamaicans eating lionfish. Television programmes, videos of high-profile locals like Prime Minister Bruce Golding enjoying meals of lionfish, and some of the hotel industry’s most decorated chefs preparing what Tufton describes as “good food” are broadcast regularly. Tufton believes that Jamaicans can eat their way out of the lionfish problem. “I believe the way to control the lionfish is to promote its consumption. We are going to bring in chefs who know how to prepare them and we are going to eat them,” Tufton said at the start of the campaign. Jamaica has one of the highest rates of endemism – unique local species – in the Caribbean and also has one of the largest numbers of invasive alien species – a total of 102. This puts it third behind Puerto Rico and the Dominican Republic, islands that are also fighting the lionfish invasion. Like Jamaica, regional governments are pitting the human predator against the lionfish in a race to keep its population in check. In May, hoteliers in Negril, Jamaica sponsored a three-day competition in which teams of fishermen caught a total of 1,446 lionfish. Last year in Puerto Rico, the U.S. National Oceanic and Atmospheric Administration (NOAA) sponsored a five-city tour of the island complete with celebrity chefs as part of its efforts to commercialise the lionfish. Elsewhere, fishermen who are willing to work hard and risk a painful sting will be rewarded. In the Bahamas, lionfish reportedly sells for about $12 per pound – up to three times other varieties. In the Turks and Caicos Islands, government has a $3,000 prize for the first fisherman who catches 3,000 of the candy-striped predator. The lionfish’s adaptability to the mangrove and seagrass beds that provide sanctuary to juvenile reef fish will, scientists say, make it difficult to eradicate. Already there have been sightings at the Bogue Lagoon, the primary mangrove area within the Montego Bay National Park. “Sightings have been reported along the residential periphery of the Bogue Lagoon Fish Sanctuary. It would stand to reason that they may be distributed throughout the deeper reaches of the lagoon, however, reports are limited and proper underwater surveys are inhibited by poor visibility,” Zane said. With several countries affected, governments are working together to find a common solution to the problem. The United Nations Environment Programme’s Global Environment Facility (UNEP-GEF) is funding the Mitigating the Threat of Invasive Alien Species in the Insular Caribbean Project, which aims to assist regional scientists from Trinidad and Tobago to Bahamas, to come up strategies to manage the threat of Invasive Alien Species (IAS) including the lionfish. The programme aims to develop a system for early detection, response and control of invasive alien species as well as systems to prevent their introduction. The four-year project will tackle IAS in five countries including Trinidad and Tobago and St. Lucia, as well as the lionfish infestation in Jamaica, Dominican Republic and the Bahamas. The University of the West Indies Discovery Bay Marine Lab is working with the Montego Bay Marine Park, NEPA and other stakeholders to develop a management strategy, record data on the lionfish and develop passive capture mechanisms. In the short term, Zane proposed culling as the most viable response. He is also calling for an immediate ban on the capture of predator populations including the Goliath and Nassau Grouper and protection for branching corals. Worldwide, the impact, prevention and control of invasive species are estimated to cost $100 billion and the damage they cause at $1.4 trillion, or about five percent of global GDP.